Deus X Machina are from Argentina and should not be confused with the Greek prog band Deus ex Machina. 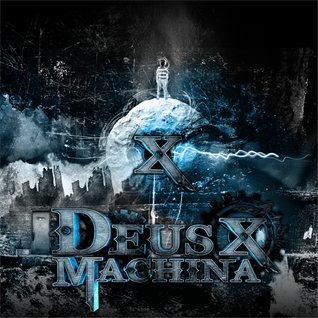 Deus X Machina are more power metal with a healthy dose of progressive metal thrown in for good measure. If I were to compare their sound to someone, I’d say they are a mix of Stratovarius, Angra and maybe Sonata Arctica or even Symphony X. The first thing I noticed was the vocals of Anton Darusso. Any time a band is mixing these two metal sub-genres, they better have a vocalist with a damn good range and tone. Darusso has all of that. Not to be forgotten, the band can play too. Plus, I like the fact that every song isn’t at a Dragonforce pace. For example, “The Devourer” switches gears mid-song to slow down before it kicks into a higher gear for the keyboard/guitar solos. And yes, there are plenty of very tasteful solos too. “Enslaved” is another well-written track too. Just enough dynamics to make it interesting. The problem is that, as the album progresses, some of the songs tend to blend together for me. “Absolute Reality,” “The Curse of Capistrano,” and “Under the Clouds” are all rather similar. The ballad “Farewell” is a well placed change of pace though. The most interesting song is the cover of the Survivor classic “Eye of the Tiger” which the band makes into a power metal song. You can tell it’s the same song but they make it over as a power metal song. Does it work? Well, not really for me. It’s clever and somewhat funny. I am not sure if that was the point though. I do think that Deus X Machina will appeal to power metal fans who want a band that isn’t trying to go at light speed for every track. Given that this is their debut album, I think it’s a good showing and hopefully they grow as songwriters.